In my opinion, next to Tiffany there is no more interesting American Manufacturer of quality swords than Saurbier. The mixing and matching of features such as grips, blades, mounts, scabbard etching and inlays is what makes Civil War Sword Collecting interesting, and Saurbier was "The Man". I have probably owned 10 Saurbiers with special features in the past year and wish I had kept every single one. I could have had a very impressive collection of a single manufacturer that presented a grouping with no sword appearing to be the same pattern as the next. Next to the Daniel Hart Sword (which is offered for sale in this listing as well), this sword is the most unusual that I have come across to date. 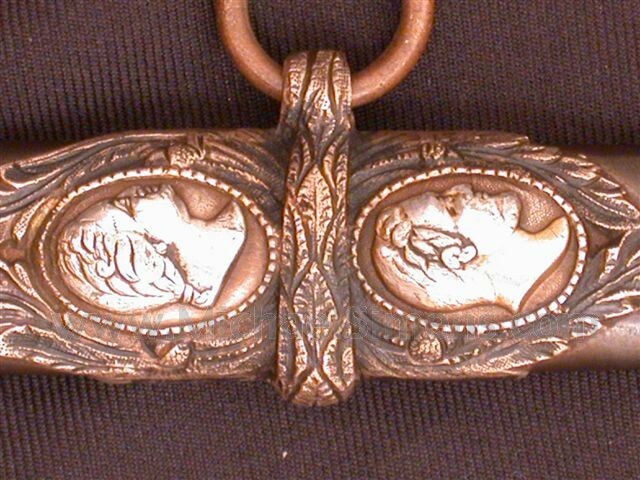 It is adorned with 5 silver medallion inlays on the scabbard mounts nearly the size of half dollars. The silver inlays are huge and I've never seen anything like it. In addition, the top two inlays appear to be Washington and Lincoln wearing crown wreaths of laurel. I've never seen Lincolns likeness on any Military Weaponry that was of wartime manufacture. The grip is of silver plated pewter and has additional inlays on the pommel cap and the top of the pommel. The blade retains all of its etching and shows fine condition with a mounted bugler just above the ricasso. The scabbard body is a smooth-as-butter dark blue-gray patina. 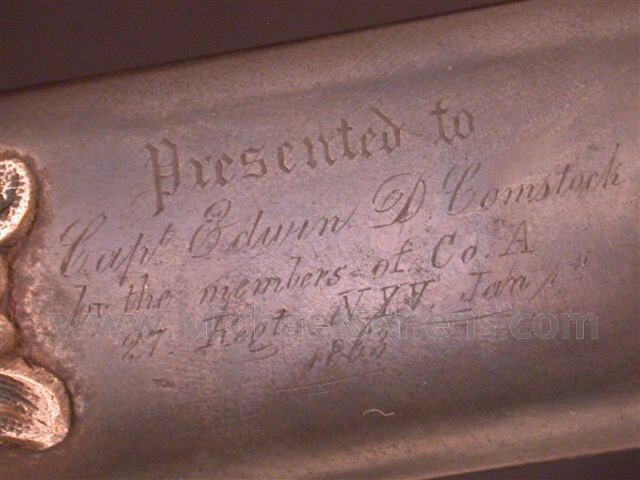 The sword was presented to Captain Edwin D. Comtsock of the 27th New York in January of 1863. He rose from Sergeant to Captain from May of '61 to May of '63. He was then commissioned a Captain in the 1st New York Veteran Cavalry. With the 27th, he saw action at Battle of Bull Run, Va., July 21. Advance on Manassas, Va., March 10-15, 1862. Siege of Yorktown, Va., Seven days before Richmond June 25-July 1. Gaines' Mill and Chickahominy June 27. White Oak Swamp and Glendale June 30. Malvern Hill July 1. Crampton's Gap, South Mountain, September 14. Battle of Antietam September 16-17. Duty in Maryland till October 29. Movement to Falmouth, Va., October 29-November 19. Battle of Fredericksburg, Va., December 12-15. "Mud March" January 20-24, 1863. At Falmouth till April. Chancellorsville Campaign April 27-May 6. Operations about Franklin's Crossing April 29-May 2. Maryes Heights, Fredericksburg, May 3. Salem Heights May 3-4. Banks' Ford May 4. With the Cavalry, Comstock saw action at Upperville, VA; Snicker's Gap, VA; Piedmont, VA; Winchester, VA; New Market, VA and Newtown, VA. 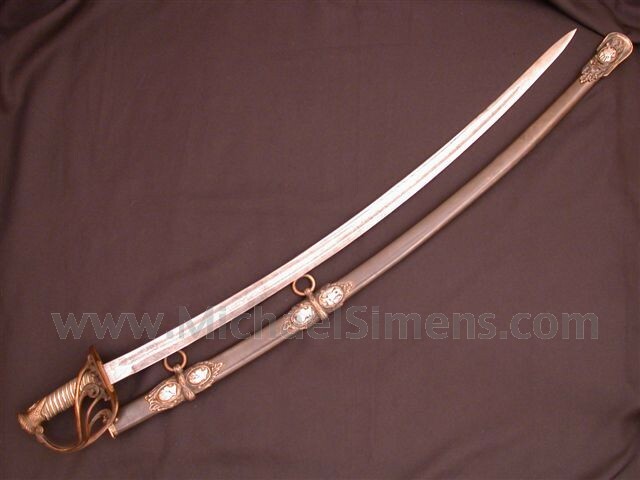 This is a stunning sword in terms of looks, is possibly a one-of-a-kind and it has a ton of good history with it. 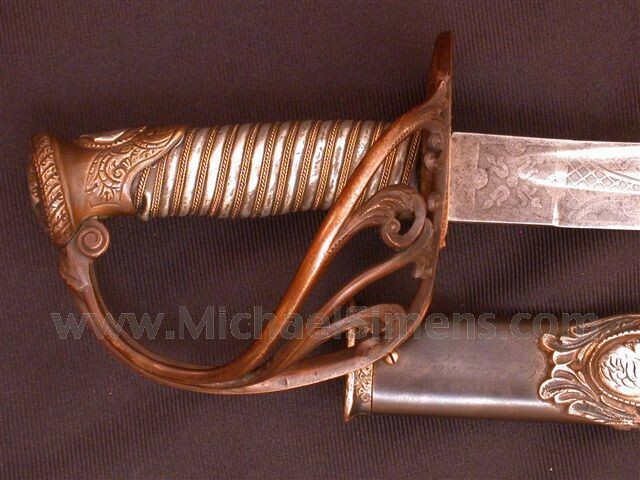 If you are a Civil War Sword collector, this is a great item. If you have yet to aquire your first, you could hardy do better in terms of the bells & whistles that make these artifacts desirable. This is a wonderful item.